The 28-year-old will join the Exiles in the summer from Munster, where he has won two Heineken Cups and two Magners League titles. O'Leary will replace former England scrum-half Paul Hodgson, who will leave London Irish for Worcester at the end of this season. Capped 24 times, O'Leary was part of Ireland's Grand Slam-winning side in 2009 and he was selected for the British and Irish Lions tour to South Africa only for an ankle injury to rule him out. "Joining London Irish presents a new and exciting chapter in my career and one that I am really looking forward to," O'Leary said. "I have thoroughly enjoyed my time at Munster and the Heineken Cup triumph in 2008 will always remain a highlight. "I'm looking forward to working alongside Brian and the coaching team and testing myself in the Aviva Premiership and playing alongside a very talented squad at London Irish. I have been lucky enough to be part of some winning teams at both Munster and Ireland and I hope to have even more success as a London Irish player." Exiles director of rugby Brian Smith said: "Tomas will be a fantastic addition to our squad. 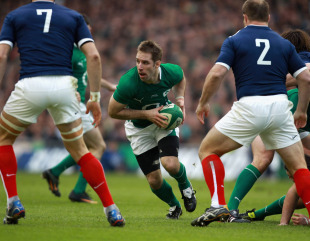 He is a proven scrum half who has represented his country at the highest level. He will bring with him a wealth of experience and a winning mentality. We look forward to welcoming him to the club this summer."